Jeanice H. Cousins slipped peacefully into eternity at RiverStone Hospice Home on April 8, 2019, after a brief illness. She was born May 23, 1925, to Lawrence and Mary Hodgkins, into a family of seven children, along the rocky coast of Maine. She is survived by her youngest brother, Jimmy. She often regaled us with antics recalled from her youth. After graduating high school at 17, she worked for the Clerk of Courts and Selective Service in Ellsworth and Augusta, Maine. Her final days were filled with memories from her childhood and with the humor which defined her in life. She and her beloved husband Stewart (deceased 2002) were married after WWII in 1946, started a family and moved to pursue opportunities in the West. 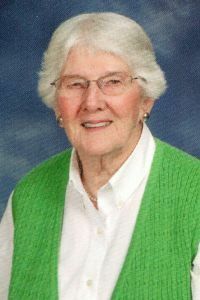 She cultivated lifelong friendships at the First Congregational Church, the YMCA where she taught swimming, and West Park Village where she lived for the past nine years. Mom had a zest for life. She was an enthusiastic athlete and enjoyed hiking, tennis, skiing, synchronized swimming, group fitness classes, biking, gardening, travel and RVing. Trips to Maine were a favorite destination, the love of which was passed on to future generations. She and Dad adored their grandchildren and created fun experiences with them throughout their childhood. Beth Greany, Julia Jameyson, Paul Marchello and Chris Newton all have fond memories of Grandma Jeanice. She leaves a legacy of four great-grandchildren who knew and loved her well. Jeanice will also be deeply missed by her daughters, Mary Lou Marchello (Billings) and Annie Newton (Denver); and her sons-in-law, Ben Marchello and Tim Newton, whom she bragged were the best in the world. Her family extends their deepest gratitude to Dr. Neal Sorensen, who cared for her with kindness and humor for 30 years, the staff of West Park Village for their loving attention and care of her over the past decade, and RiverStone Hospice Home.